A good pub for real ale lovers this one. Located towards the town-end of Cathedral Road (near to Sophia Gardens), the Cayo Arms has been voted CAMRA pub of the year on two previous occasions (2001 & 2002). The Cayo Arms comprises of two converted town houses that have come together to form a pub with guest house facilities located directly above it. The building itself was formerly known as the Apollo Hotel prior to it becoming the Cayo Arms 6 years ago. As you walk into the Cayo you will notice a large staircase directly in front of you, which is used to access the guest house facilities. The bar area is located to the left of the staircase, whilst the main seating area runs from the right of the staircase and goes around behind it to the back of the pub. Whilst this pub does offer a fantastic matchday atmosphere, it can sometimes be a little bit awkward to follow a game on the large screen TV, due to the awkward positioning of the staircase. There are several smaller TVs dotted about the pub so don't let this put you off. Speaking of matchdays - especially Wales rugby matchdays - the Cayo erects a marquee at the rear of the building to cope with the large numbers of fans that pile into the pub enroute to the game. This marquee is used to house a temporary bar and BBQ, which ensures that the fans are well lubricated and fed. There’s also a TV hung from the frame of the marquee so you can follow the build up to a match. Back inside the pub and stood at the bar, you will notice the large number of hand pumps dispensing real ale. There are usually at least 6 real ales on offer at any one time, including ales from the Welsh brewer Tomos Watkins. The service at the bar is always efficient and friendly. Food is served at the Cayo Arms throughout the day and it’s a very popular place to eat. The menu is fairly typical of a traditional style pub such as this and offers all the usual favourites, including a very appetising Sunday Roast. Judging by the number of Full English that were being brought down the stairs on my last visit, the breakfast options are very popular too. The Cayo holds a quiz night every Sunday evening at 8pm. 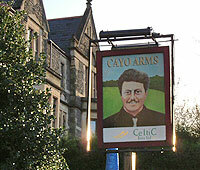 For those interested, the Cayo Arms is named after Julian Cayo Evans, leader of the Free Wales Army in the 1960s.